Stone Ring Press is the brainchild of Editor and Publisher Edwin Wollert, who loves quality fiction but also feels frustrated at the growing difficulties promising authors face when submitting their work to the publishing industry. The business itself remains in constant change, with “how to” guides receiving annual (and sometimes more frequent) updates, and agents and editors altering their interests or requirements. The old adage about hooking up with an agent being more difficult than finding an editor likely remains true, which is hardly encouraging news as agents themselves in turn have huge troubles finding editors willing to take a chance on new work. Simply put, it’s never been more difficult to break into publishing as a talented rookie, and at Stone Ring, we take pride in offering exceptional new talent. Despite the hazards facing new (and sometimes established) writers, this is curiously an excellent time to develop the Small Press, and thus Stone Ring was born. Founder Edwin Wollert earned his undergraduate degree at Butler University and his doctoral degree at Oregon State University. 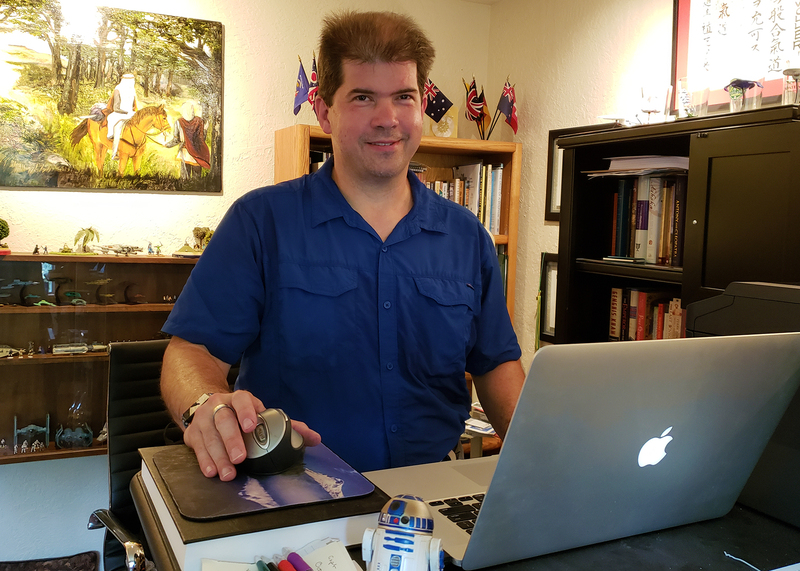 He grew up in places like Australia, Mexico, and Hawaii, has taught English and Spanish, and has worked in various customer service and educational fields, prior to embarking upon serving as editor and publisher of Stone Ring Press. He is an avid hiker, ballroom dancer, scuba diver, and aikido practitioner, and ultimately decided to work with the likes of Dale Geraldson and D. T. Kizis when he accidentally learned of their work and its quality. Author Dale Geraldson earned a master’s degree in philosophy from Ohio University, and currently resides in Oregon, teaching his specialties of logic and ethics. The Arthurian legends have always been his passion, and he has researched their influence upon his own academic specialty, which eventually led to his reworking of the quest for the Holy Grail. Dale has always wondered about the events leading to the downfall of Camelot, and focuses on the political as well as magical background of Arthur’s kingdom in his breakout novel. Dale even likes to describe himself as a Connecticut Yankee revisiting Arthur’s Court, since he hails from the Constitution State, and has lived in six other states before finding his home in the Pacific Northwest. His novel Dreamers of the Grail marks Stone Ring’s initial foray into the huge and exciting realm of fantasy fiction. Author D. T. Kizis holds a master’s degree in history from American Public University, and lives in Alaska, where he has worked as an emergency medical technician, first aid trainer, and history lecturer. He brings these elements of his background together into Packs, a contemporary piece of literary fiction set mostly within the wilds of Alaska. D. T. has traveled extensively, getting his boots and backpack dirty in six continents, and got busy writing largely from his experiences of educating the public about predators, especially wolves, having served as the educator for Wolf Song of Alaska for many years. His favorite species remains misunderstood, and he describes his novel as a canid version of Watership Down meeting Zen and the Art of Motorcycle Maintenance. Kendra Wollert, dedicated and patient wife of the founder of Stone Ring Press, now acts as copy editor and marketer. That is, she makes time for such essential activities when not consulting, having had previous careers as a veterinary technician, gemologist, and elementary school teacher. She hails from Michigan and Indiana, and operates her own consulting company for Assistive Technology. Check out her own web site for all your special educational technological needs at www.atsuperpowers.com.